If you’re a Cincinnati native, the name “Symmes” should be very familiar to you. That name adorns streets, townships, and businesses around greater Cincinnati as a relic of the man who originally owned the entire town: John Cleves Symmes, a colonial-era real estate mogul who owned and sold off a giant tract of land in Southwest Ohio called the “Symmes Purchase”. It’s always interesting to hear how an entire city, it suburbs, probably around a million people today, was built from a single plot of land owned by one person. An even more interesting story is that of his nephew and namesake, who dedicated his life to developing and popularizing a highly detailed theory of a hollow earth. Between them, the two John Cleves Symmes had one of the most interesting careers in real estate of any family in history. Symmes senior. "I would do anything for love..."
Symmes Senior was a big shot financial tycoon of the revolutionary period, essentially a Joe Kennedy of the time. His financing helped pay for the revolutionary war, and in return he was allowed to purchase over 300 thousand acres of land in current-day Ohio for about $250,000 — not exactly the Louisiana Purchase in the world of land bargains, but not bad. This “Symmes Purchase” was one of many giant land speculation deals made as the frontier marched west, in which a few people got phenomenally rich by selling off their land to make new farms, townships, essentially new communities. 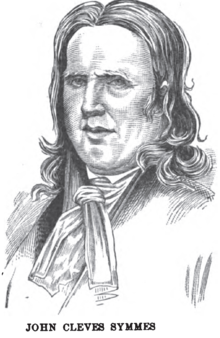 Symmes was a certifiable big-shot — he was a delegate to the Constitutional Congress from Delaware, was an in-law of John Jay, and later was father-in-law to president William H. Harrison who himself was one of the eight U.S. presidents from Ohio. As America expanded west, staes like Ohio became briefly prominent on the National stage as the frontier swept by — note that while there are 8 presidents from Ohio, none were president in the 20th century. This is old man Symmes' back yard -- don't lose your frisbee in there, or he'll sic his dogs on you! 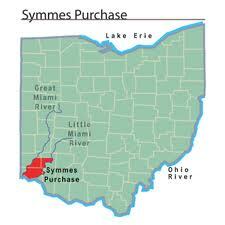 Notwithstanding Symmes’ prominence in Ohio history, he generally made a mess of administering his giant land grant. Land surveying done to map the square boundaries of townships was done aligned to magnetic north instead of true north, so the east/west boundaries of townships were badly distorted. Symmes also apparently had a habit of selling land not actually in the Symmes Purchase, sometimes as far north as Dayton. He wound up in court for much of his later years, defending the various legal and accounting transgressions racked up in selling off the purchase. Despite his poor surveying and shady accounting, you can’t dispute that Symmes made a hell of a mark in real estate. I doubt we’ll ever see again that scale of real estate on this planet (at least the outside of it). Not that many won’t try. Interestingly enough, Symmes’ own nephew (who went by John Cleves Symmes Junior, in clear violation of the rules of name suffixes) beat his uncle in the real estate game in sheer audacity by relentlessly pursuing his theories on the center of the earth. 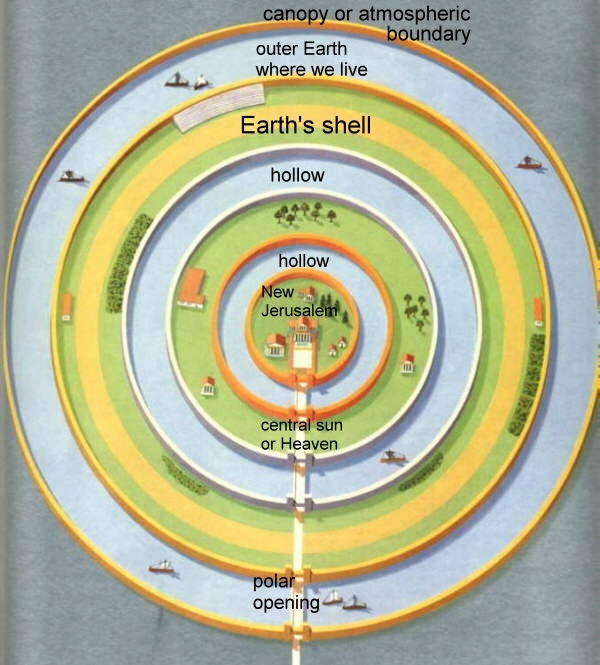 His amazing theory, in a nutshell: 1) the earth is a hollow shell, not a solid ball, 2) the inside surface of the shell is habitable and inhabited, and 3) you can visit the interior via giant gaping holes at the North and South poles of the earth. Symmes Junior. Or Mr Bean? 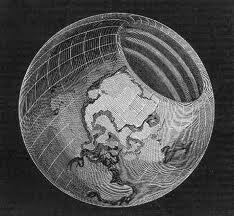 Symmes argued that the earth (and in fact all celestial bodies) is not a solid ball but a hollow shell, containing a set of smaller concentric shells, all a few thousand miles thick. Each one is open at the two poles, giant gaping holes thousands of miles across. The edges of the holes are rounded, so you could walk up to the hole, keep going around the rim, and wind up all the way around on the inside surface. If you did, you might not even notice — the interior surface is just as warm, well-lit, and habitable as the outside surface. He supposed that the inside of at least the outermost shell would have plants, animals, lakes and oceans just like our side. 1. There apparently were great schools of fish migrating north every season that did not reappear coming back south the next season, thereby violating the Law of Conservation of Seafood. Symmes argued that the fish simply swam around the rim into the interior oceans, migrated to the south pole on the inside of the earth, and came out the other side — they’re just doing laps around the earth. 2. Ever notice that it’s colder in North American Midwest than parts of Europe at the same latitude? After all, London is further north than Duluth. Symmes said it’s because the northern hole dips further south over North America, and of course the closer you are to the verge, the colder it gets. For some reason the north verge was centered on magnetic north instead of true north. 3. Various crap washing up out of the ocean along the northern shores of Europe, such as driftwood, trees, etc. looked tropical in nature, prompting Symmes to suggest that they were coughed up from more temperate inner oceans through the northern verge. Okay… but why is this simpler than assuming they just drifted north along the outside of the earth? At this time, the extreme northern parts of the earth were still being explored, and adventurers reported unusually warm regions in the far north (though still not quite to the North Pole). Several described passing through extremely cold, icy lands only to find open seas even further north. Symmes took this to mean they had crossed the verge and were inside the earth heading towards the equator — so it’s only natural that they would see warmer seas. Lots of expeditions were being proposed towards both poles, and in fact Symmes lobbied Congress (unsuccessfully) to mount an expedition to verify his theories. While he was never to see a direct test of his theory in his lifetime2, his theory was well-known and was certainly on the minds of later explorers. 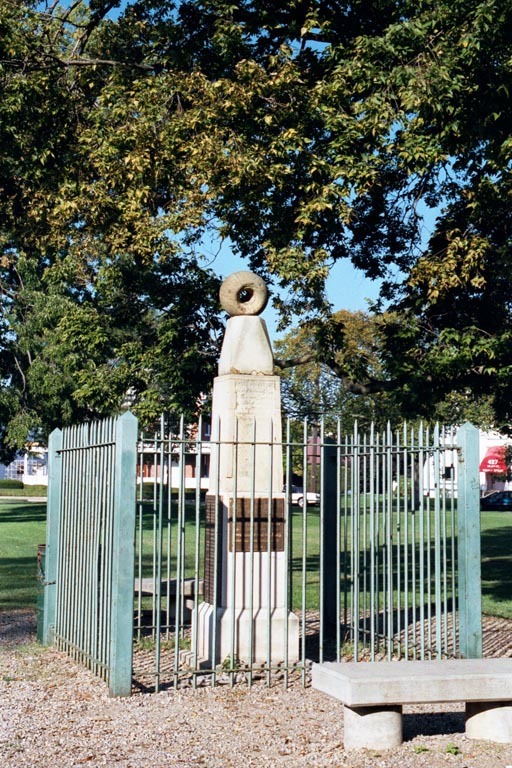 Of course, being nationally known isn’t always a good thing — “Symmes Hole” was a common term across America for any ridiculous idea, forcing Symmes to join a very exclusive club with Seward. To be fair, there were unusual phenomena at the poles, so perhaps the debate seemed more relevant than it does now. Compasses get all screwy in the far north hinterlands — imagine the consternation of the first explorer to head past the magnetic north pole and see his compass flip south, while still hundreds of miles from the north pole. Symmes theory actually explains this quite nicely — he believed that compass needles were attracted to the rim of the verge, so naturally it ought to flip as you walk over the rim and head inside the earth. Nevertheless, the concept of magnetic north was well-known at the time — after the mess his uncle made surveying to magnetic north, you’d think he’d understand it better. “Them Symmes boys”, they’d say, “they just didn’t have any luck with that thar magnetic north.” They said that all the time. “Them” being 19th-century intellectuals with a thorough understanding of surveying errors and planetary physics — that is, no one. As you might expect, Symmes had to defend his theory from all sorts of common-sense problems brought up in his many lectures. First of all, if the interior is supposedly habitable, how does enough light get in for the plants to grow? Symmes and his followers (yes, there were acolytes) argued that plenty of light from the sun would leak in through the wide polar holes, so much light in fact that it would be brighter inside than on the outside of the earth. He warned the first explorers to bring their sunglasses. Second, if our earth has a giant hole at either end, shouldn’t we see the holes show up on the moon during a lunar eclipse? Instead of a funky doughnut-shaped shadow, we always see a perfect circular shadow cast by the earth on the moon. Symmes blamed this on the “haze” hanging around at the poles — apparently the openings were so filled with smoke that the smoke itself cast enough of a shadow to fill in the gap in the Earth’s shadow. The “haze” is also why you can’t see across to the other side of the rim — there’s just too much fog to see through, so as you’re standing on the rim, the sky above looks (conveniently) like open space, free from any odd planet parts. Symmes had less luck explaining why we don’t see holes on other celestial objects like the moon or sun, though he did offer the rings of Saturn as a halfhearted stab at plugging this hole. 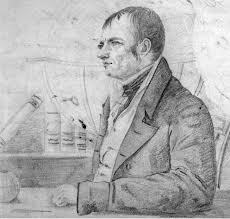 Symmes scientific standing was never much stronger in his lifetime than it is today. 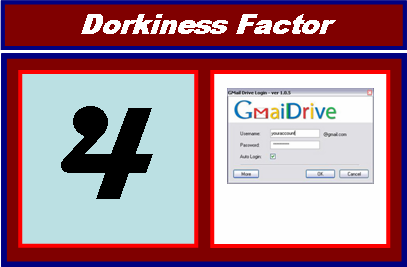 As he began to flesh out the theory, he used the standard methods of scientific amateurs (and crackpots) everywhere, by using a letter-writing campaign to universities, governments, and other miscellaneous luminaries around the world. He toured the country for years on the lecture circuit, explaining his ideas to entertained by largely unconvinced audiences. He was never able to convince anyone to pay for an expedition to the northern hole, and had to turn down an invitation to join a Russian expedition because he ran out of money. In fact it seems the theory consumed his entire life — as his own son wrote, “I thought that a theory which left a man so poor was not very valuable”. Yes, it does not pay to struggle against conventional science, particularly against the towering giant of physics, Issac Newton. It was Newton who first worked out how strong gravity would be for someone standing on the inner side of a hollow shell planet. Surprisingly, if you could stand on the inside of a hollow spherical shell, you’d feel absolutely no gravity, no matter how thick the shell is. You’d float freely, bouncing around inside the hollow center, feeling absolutely no attractive pull towards the shell. Kind of difficult for those inner-surface inhabitants to get on with their daily lives, having to cling to blades of grass to keep from floating off into the “mist”. Nevertheless, Symmes pointed his theory in direct opposition to the “Newtonian model of the earth”, that is a solid spherical dirtball that gets colder toward the poles. Perhaps this reflect the crackpot tendency to take aim at the greatest luminary of the day, which continues to this day in the theories of hundreds of amateurs intent on disproving Einstein (see our own discussion of this fascinating topic, I’ve got a theory and I’m crazy). Speaking of Symmes’ son Americus, the geographically-named son himself didn’t have much use for the theories (after seeing them ruin his father) until later in life, when he became one of a small handful of proponents who published treatises defending the theory. And here’s where the story turns from a charming idiosyncrasy to truly bizarre — Americus claimed that several explorers actually did venture far into the fertile lands on the inside surface of the earth, and found far more than missing fish. He describes the voyage of Mr. Seaborn, who traveled far enough to meet a previously-unknown human civilization that was named (what else) Symzonia. It’s really unclear to me where relatively down-to-earth wackiness turns into complete abject fantasy regarding the topic of Symzonia, but clearly the people behind it make John Symmes look like a MacArthur Genius Grant winner. My casual approach to research precludes me from commenting much until I do some more book learnin’, but the excerpts I’ve read from “Symzonia; a Voyage of Discovery” by Adam Seaborn bring this to a whole new level of ludicrousness. I gather there is some controversy over whether this book supposedly written by the inner-earth explorer was actually written by Symmes himself, or written by a critic as a subtle satire (along the lines of Johnathan Swift). Just to give you a taste — the race of humans sticking to the inside of the earth were described as having “Roman noses”, which is the 19th century’s best attempt at tactfully referring to a Jewish civilization. In fact they were identified as the lost tribes of Israel. The path from here leads to even more bizarre places, including the earth’s interior being a hideout for surviving Nazis after WWII and even as the home base of the famous Men In Black, Earth’s alien-oriented police force. One of these days I promise to get to the bottom of the baroque endings of Symmes’ theory after his death, and give a full report here. Until then, I just have to start planning what will go on top of my tombstone — the bar has definitely been raised.